The time has come for another exciting season of high school football. We kickoff the 2018 campaign with Campbell County heading to Dixie Heights for this Friday night’s U.S. Marines Battle of the Gridiron Series Game of the Week. It’s a new era for Campbell County as long-time fixture on the northern Kentucky coaching scene, Mike Woolf take the reins. The Camels are looking for back-to-back winning seasons for the first time since ’13 & ’14. There is brand new turf to play on for the home team Colonels. Dixie Heights wants to quickly turn the page on a ’17 season in which it lost its final four affairs by an average of 29.75 points. 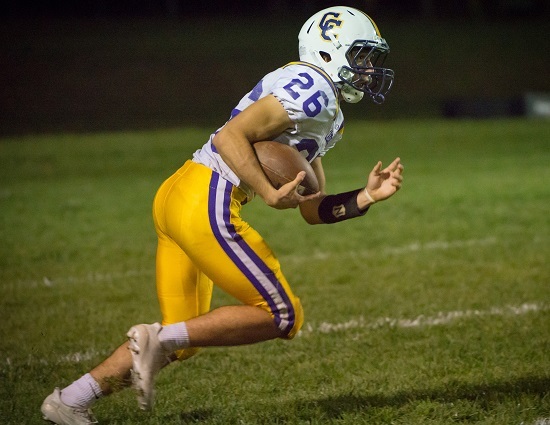 PLAYERS TO WATCH: One of the top defensive players in northern Kentucky is Campbell County defensive end Tanner Lawrence, a First Team All-NKY selection as a junior. Lawrence has spans where he can dominate a game. The secondary is deep with seniors Reid Jolly, Grant Jolly, Brady Singleton, Gavin Terhaar and Logan Harrod. Reid Jolly caught 33 passed for 458 yards with six touchdowns last fall. He also had two interceptions. Jolly’s efforts saw him be named Second Team All-NKY at the athlete position. Dixie Heights will share the wealth out the backfield. Seniors CJ Bensmen, AJ Dilts, Brady Barker and Channing Williams combined to run for 1,088 yards and nine touchdowns in ’17. Bensman also led the Colonels in total tackles last fall. He and classmate Yang Shi will pace a young and “green” defense. They look to improve on the 34 points they allowed per game and the six times they gave up 42 points or more. TEAM TRENDS: Over the first seven games last season Campbell County went 5-2 and never gave up more than 28 points. The Camels defense had trouble stopping upper echelon competition down the stretch. They allowed 65 points to Simon Kenton, 49 to CovCath and 51 to Trinity as the went 2-3 to end ’17. Campbell County must do a better job of stopping teams if they want to take things to the next level. Dixie Heights ran the ball more than 400 times a year ago. They averaged just three completed passes per contest. CAMPBELL COUNTY’S KEYS TO VICTORY: With eight starters returning on defense look for the Camels to be very aggressive on this side of the ball. They want to force the action and make Dixie Heights play from behind. Campbell County will rely on its defense early on to carry the squad. The offense returns just three starters. DIXIE HEIGHTS’ KEYS TO VICTORY: It is all about controlling the clock and keeping the Colonels defense off the field. That means keep the chains moving. The offensive line must like it is in midseason form.